IT’S TIME FOR SOME CLASSES! I’ll be announcing Save My Audition’s first set of classes on Friday, December 15th. There are some incredible instructors lined up to teach and I couldn’t be more grateful or excited to start this new adventure as part of the website. 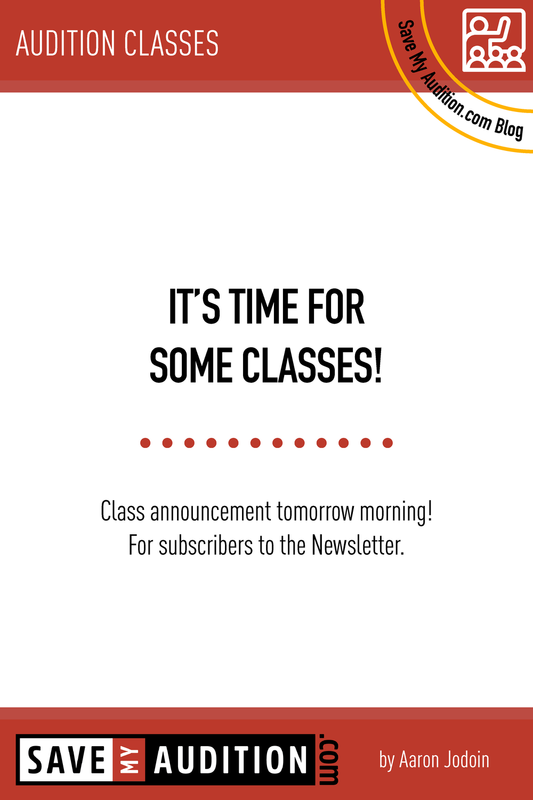 If you sign up for the Newsletter you’ll be given early access starting tomorrow morning at 9am to sign up for classes. Some other instructors are in the works for January and there are even more lined up for February and March moving forward. Each of these instructors and classes being offered are dedicated to making you better in the audition room. I’m purposefully having people who spend a great deal of time in the audition room teach classes. There are plenty of audition classes taught by people who don’t spend a lot of time “in the room”. While these classes are great and have their place, I’m trying to keep the advice and knowledge in the classroom as current as possible, and to do that you have to spend time in the room on a daily or weekly basis. Trends change quickly in this business. Who better to learn from than the people that do it all day every day? I may be most excited about the classes being taught by Amy Marie Stewart the co-founder of TheoryWorks. TheoryWorks is taking on music literacy. I’ve gone on several Facebook tangents about how important it is to learn how to read music and become a better musician and professional. If you don’t read music proficiently I highly recommend taking one of the 2 classes being offered by Amy in January and also checking out the TheoryWorks website and signing up for their online courses. You won’t regret it, and you’ll save a lot of money and relieve a lot of stress if you learn how to read music. Trust me. A lot of the money I make comes from people that need me to plunk our their melodies. Learn how to do that yourself! Save your money! Not that I mind taking it from you. Another class I’m super excited about is a class being offered by Michael Hicks, a long time friend and beast of an audition pianist. He is offering a class we’re calling PLAY MY AUDITION. There is a lot that happens with the audition pianist to make your audition happen. Most of the work that happens behind the piano you have no idea happens. But it does. And its main purpose is to make you sound better in the room. Come learn what happens back there. Learn what your music sounds like when it is played EXACTLY how it appears on the page and how you instruct the audition pianist to play it. Then hear it again as if it were a real audition. The difference may be troubling and eye-opening to you. The goal of the class is to get you more comfortable with the pianist and what it is they do behind the piano, as well as fixing your music and instructions so you can be more comfortable and confident in the room. As part of each month of classes I hope to offer at least 1 free class, open to subscribers of the Newsletter first, then to the general public. January’s free class is called ASK AN AUDITION PIANIST. Myself as well as Michael Hicks and Sharon Kenny, all three of us audition pianists extraordinaire will sit in a room and answer any questions you have, tell some great stories of our experience in the audition room and help you to demystify the audition pianist. There is a ton of information to learn from each of the instructors offering classes. On top of working with the instructors, I will be in the room for each audition class as the pianist and offer advice and help in making sure that your music looks amazing and is set up for your success. And if you need help making what we suggest happen, I know a website that can totally make that a possibility. If classes sell out I will be opening up audit slots for students to pay a reduced rate and come observe class and learn by watching. Auditors will of course be able to ask questions and participate in group discussions, but will not get a chance to work one-on-one in front of the group with the instructors. I’m trying to open up classes to as many people as possible, everyone who wants to should have a chance to come learn! Make sure to ask for a Save My Audition Gift Card for the holidays. Have someone you love pay for your classes! Back to our regular blog posts next week. I’m very excited about classes and hope to offer a great offering of classes each month to help you in the audition room.